I’ve written a few times about the importance of self defense. And I’m definitely a fan of self reliance. So kudos to Mr. Mothershead, a true American. In the spirit of fairness, though, we should say something nice about the crook. Maybe Mr. Hendy is an efficient liberal who wanted to take something that didn’t belong to him, but figured there was no need to use the government as middleman. Will the Last Job Creator to Leave California Please Turn Off the Lights? And we all know that California has one of the nation’s greediest governments, imposing confiscatory tax rates on a shrinking pool of productive citizens. So it is hardly surprising that the Golden State is falling behind, losing jobs and investment to more sensible states such as Texas. But not everybody is learning the right lessons from California’s fiscal and economic mess. There’s a group of crazies who want to increase the top tax rate by five percentage points, an increase of about 50 percent. And they have made Kim Kardashian the poster child for their proposed ballot initiative. I’m relatively clueless about popular culture, but even I’m aware that there is a group of people know as the Kardashian sisters. I don’t know who they are or what they do, but I gather they are famous in sort of the same way Paris Hilton was briefly famous. And they have cashed in on their popularity, which may not reflect well on the tastes of the American people, but it’s not my job to tell other people how to spend their money. But not everybody share this live-and-let-live attitude, which is why the pro-tax crowd in California produced this video. Or I could expose their economic illiteracy by pointing out that higher tax rates would accelerate the emigration of investors, entrepreneurs, small business owners, and other rich taxpayers to zero-tax states such as Nevada. But I won’t do those things. Instead, like the Nevada Realtors Association and Arizona Business Relocation Department, I’m going to support this ballot initiative. Not because I overdid the rum and eggnog at Christmas, but because it’s good to have negative role models, whether they are countries like Greece, cities such as Detroit, or states like California. So here’s my challenge to the looters and moochers of the Golden State. Don’t just boost the top tax rate by five-percentage points. That’s not nearly enough. Go for a 20 percent top tax rate. Or 25 percent. After all, think of all the special interests that could use the money more than Ms. Kardashian. And if somebody tells you that she will move to South Beach or Las Vegas, or that the other rich people will move to Texas, Wyoming, or Tennessee, just ignore them. Remember, it’s good intentions that count. In closing, I apologize to the dwindling crowd of productive people in California. It’s rather unfortunate that you’re part of this statist experiment. But you know what they say about eggs and omelets. By the way, here’s some humor about the Golden State, including a joke about the bloated bureaucracy and a comparison with Texas. Here’s my politically correct Christmas greeting from last year, and here’s the PC version of ‘Twas the Night Before Christmas that I posted this year. But what about politically incorrect humor? Okay, even though Christmas already has passed, you’ve twisted my arm. We’ll start with some Christmas music from Achmed the Dead Terrorist. And here’s Larry the Cable Guy, with some more Christmas carols. But if you prefer to be PC rather than un-PC, here’s a great Jay Leno joke about terrorism during the Christmas holiday season. 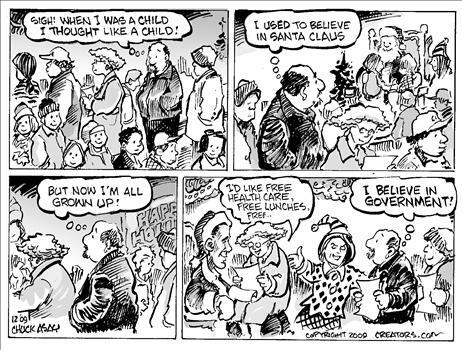 Chuck Asay is a superb cartoonist, and he produced one of my all-time favorites, capturing the negative impact of big government. But this one is quite appropriate for today. And if you like that cartoon, you may want to check out this one and these two. Overseas Americans are not exactly happy that federal law is making their lives so miserable, so I’m not surprised that they seem to be the ones who put together this great parody. U.S. Federal agents arrested Santa Claus earlier today at the North Pole. The United States Department of Fish and Wildlife has arrested Santa Claus, an elusive figure with many aliases (e.g., St. Nicholas). On the morning of 24 December, 150 heavily armed Fish and Wildlife special agents raided Claus’ North Pole compound, seized several tons of exotic woods forbidden by the Lacey Act, arrested Santa Claus and a female accomplice identified only as Mrs. Claus, and liberated thousands of diminutive slave labourers known only as “Elves”. Claus has been charged with multiple counts of money laundering, illegal exportation of currency, illegally importing into the United States toys made of contraband–rare woods, ivory and other banned substances. He has also been charged with violations of slave labor and child labor laws, hundreds of patent and trademark violations, and illegally entering and exiting the United States. Indeed, Fish and Wildlife agents also seized an unidentified aircraft called a “sleigh” which had numerous secret compartments holding the contraband. Fish and Wildlife agents charged Mr. Claus with animal cruelty with regard to the caribou that he used to launch this “sleigh”. Apparently Claus worked in Hollywood during the 1940s and 50s making autobiographical films, such as Miracle on 34th Street. During that time he applied for and received U.S. citizenship. Kudos for whoever put this together, but remember that there is a big component of truth in this satirical piece. More than anyone else, overseas Americans suffer because of bad U.S. laws.